Just a girl with a hammer: Come hell or high water . . . oh god, what did I do? Come hell or high water . . . oh god, what did I do? Because I had AC installed and I put tomatoes in the ground, it rained a lot this week. 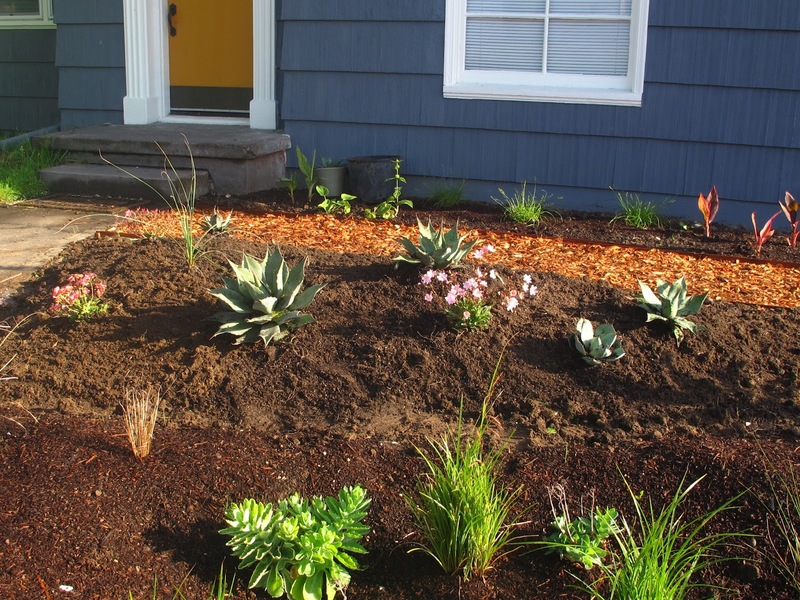 We got a break yesterday afternoon so I decided I wanted to work chicken grit into the berm out front and get the succulents planted. I went to Garden Fever and they were all out of big bags of chicken grit. I caught myself eyeing ferns before I snapped out of it and started calling other suppliers. I called Livingscape Nursery and they weren't selling it in bulk. I think that's when I muttered "Goddamn it, come hell or high water I want to do this TONIGHT." But I didn't want to drive down to Milwaukie to Concentrates NW, plus I'd never make it before they closed. I called Urban Farm Store and they had big bags! I had 20 minutes to get down to Belmont Street before they closed! When I arrived I asked for 300 pounds of chicken grit. The lady rang me up, ran my card, and as I was signing she started giggling. "I don't know why I rang you up for that. We don't have that much in stock." Son of a. It turns out they only had 200 pounds, so we had to reverse charge my card and all of that, but then I was home with my plants and my chicken grit, hallelujah. I got the Dasylirion in the ground and then the sky opened up and was like, "COME HELL OR HIGH WATER? WATCH THIS YOU SILLY GIRL." Epic. rain. y'all. 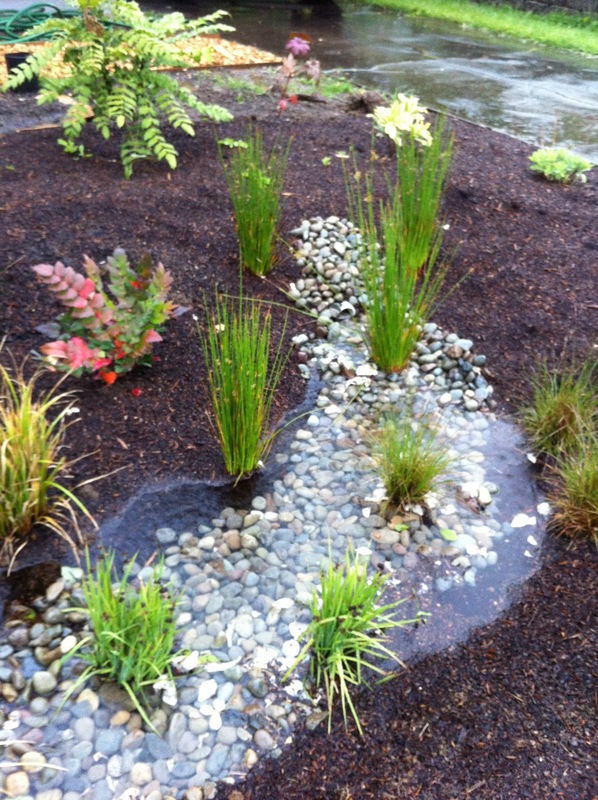 The rain garden out front, which only has one gutter feeding it, never fills. It actually had four or five inches of water. 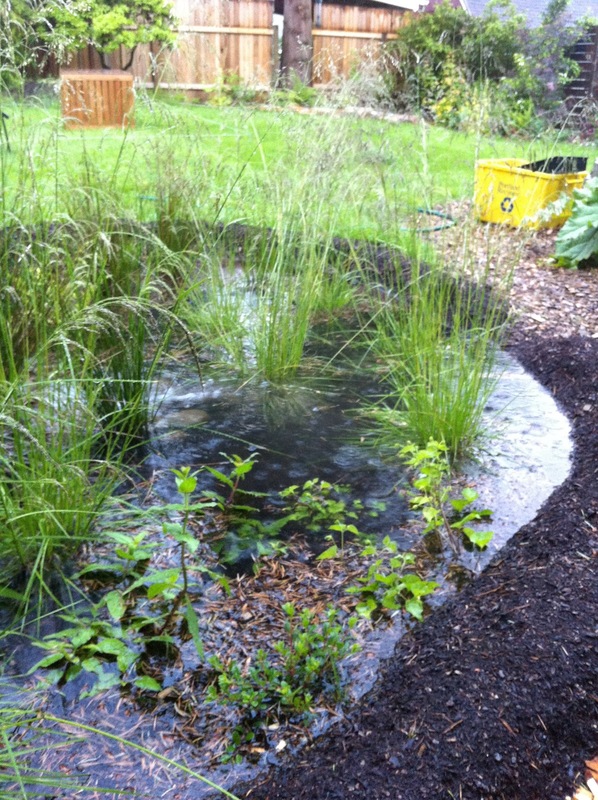 The rain garden out back, which is humongous and serves the most roof water, almost overflowed. That's why you install an overflow notch, but I honestly never thought I'd need it. Note to self: don't change perspective halfway through a video. Eventually it stopped raining and I threw on my rain boots and dry pants and got back out there. Getting the agaves out of their pots was easier than I thought it would be. Sarah gave me the helpful advice to use a garden knife around the edges of the pot, then put the agave face-down into wet soil, then pull. In most cases the pot comes right off, though your poor agaves have mud all over their faces. The back side of the berm is still a bit empty, though I have two more agaves to put in. I wish I had bought more Lewisia last weekend. 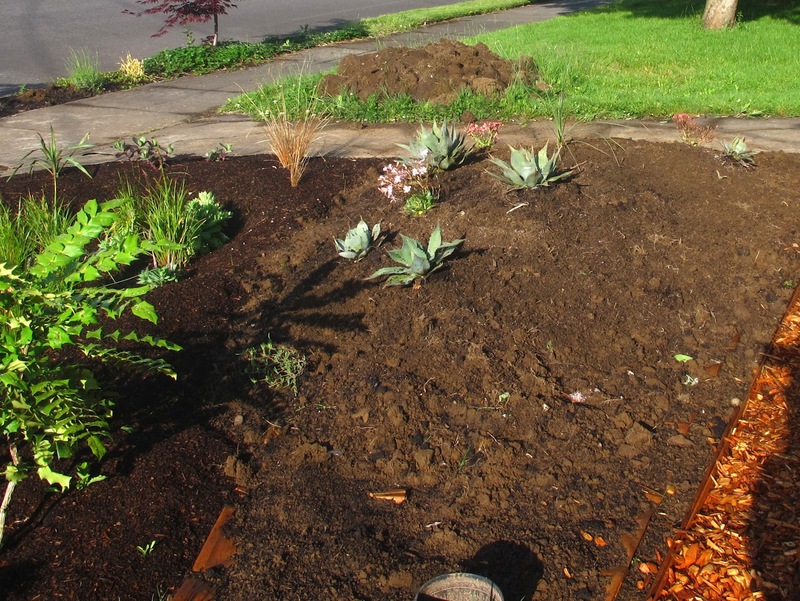 I still need to acquire rock to edge the berm, then mulch the berm with gravel, and then maybe I can just let it do its thing for the summer. I'd still like to work in a black daphne (to the right by the castor bean plant) but I may wait until fall to put it in. I can see the finish line and I think, with some tweaks (like redoing the dry rock bed and editing down the grasses), it's going to look pretty out there. BTW, fabulous idea for unpotting agaves; you have saved me many future puncture wounds. Thanks, Jane. That technique works really well--I didn't poke myself once. That's really saying something; I'm very accident prone! Oh shoot, good question! It's basically rough gravel that people put down for chickens. The chickens eat it to help them digest their food but it works to add drainage to soil. Haha I can't get over the spelling of Milwaukie...don't you know it's supposed to be Milwaukee? Mother nature was just testing you. Reminding you you'll always need an overflow notch. I was so confused when I moved to Portland and met people from Milwaukie. Wow, you're a long way from home! No, it's just a suburb of Portland to the south. Have you heard how we pronounce Aloha? You'll crack up. I have bamboo stakes galore--do you want some? Thank you! I can't wait to get them mulched. I have this irrational fear right now that someone will steal them in the night. In related news, I told some non-gardener friends I was planting agaves and they were like, "Oh, are you going to make tequila?" and when I said no they couldn't fathom why I'd plant them. Hello, they're beautiful! What do you mean it's going to look pretty? It looks pretty darn fantastic right now! Was that Saturday? I hear we broke records for the most rainfall in one hour. This happened on Thursday. We missed the torrential downpour on Saturday as we were at the coast but everything in the yard was THRASHED. Mulch everywhere! I wish I had seen it. One of my fav quotes touring through the beautiful desert garden at the Huntington was when I over heard a conversation between a couple...she said "I don't really like the look of desert plants" (I have to resist saying "what are you stupid? Why are you here, go away") then as I'm biting my tongue he says (while reading a plant tag) "Agave victoria-regina...well that's just a margarita right there in the ground....." ugh.